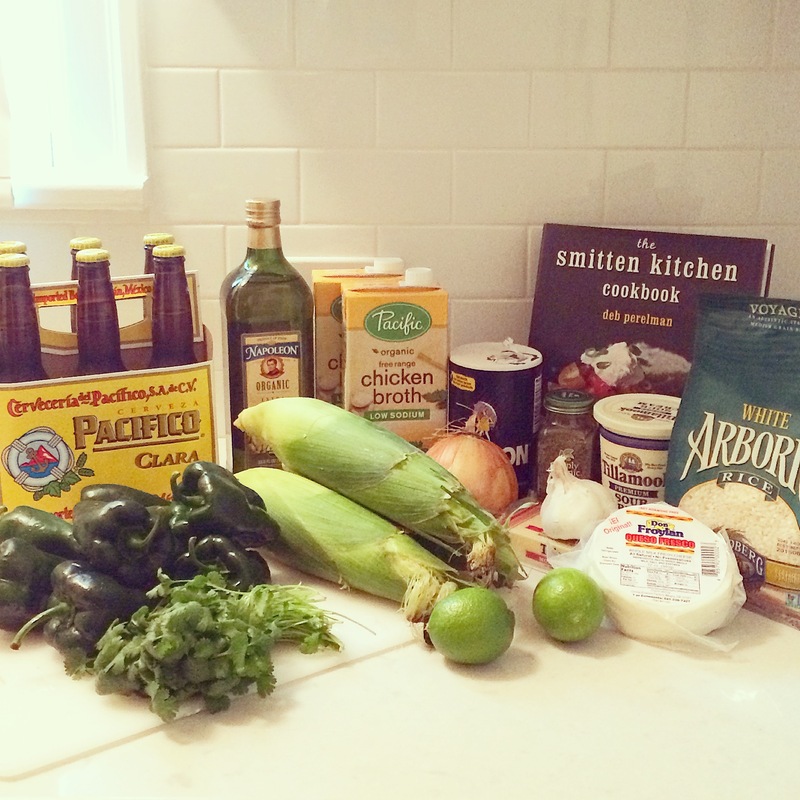 As I may have mentioned on this blog once or twice, Smitten Kitchen is one of my very favorite food blogs. So when Deb (the author) published her first cookbook two years ago, I promptly purchased a copy (and a ticket to her book signing, which was amazing). I was so excited to get my hands on the book, and read it cover to cover the day I received it. 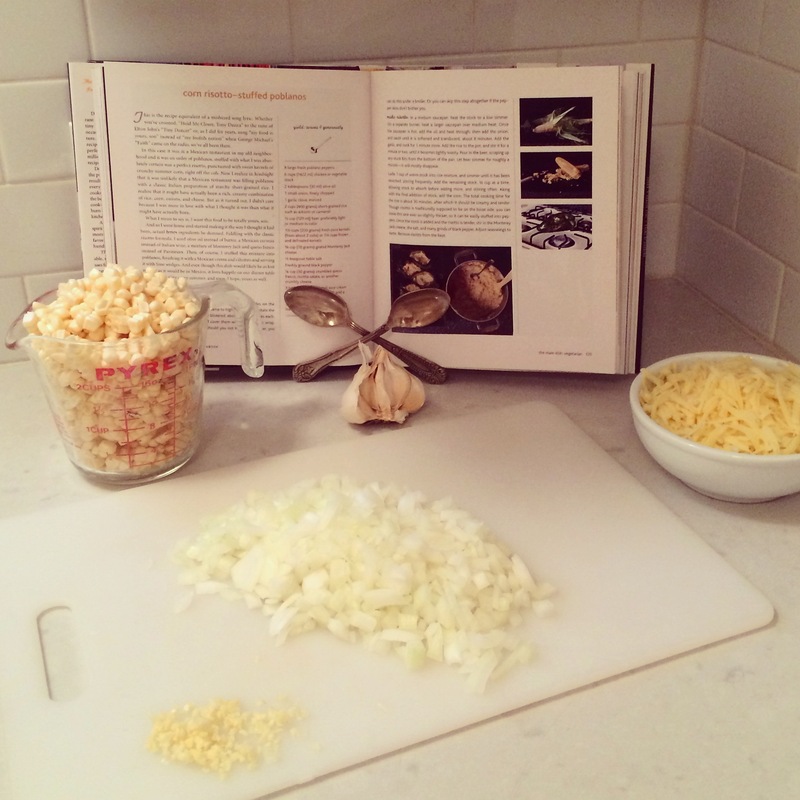 I flagged all of the recipes I wanted to try – and there were a lot. The book came out in late October, so the first thing I made was a pumpkin gingersnap tart (which was delicious, and which probably belongs on this blog). 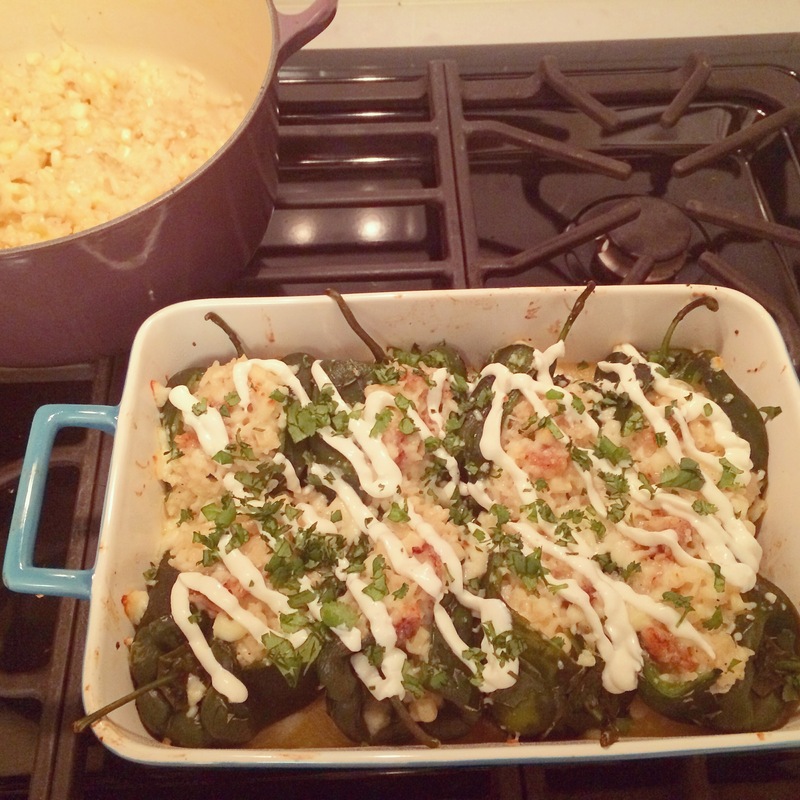 And then, of course, the cookbook went onto the book shelf and I forgot about so many of the things I wanted to make, including her corn risotto-stuffed poblano peppers (no idea where the hyphen(s) belong there, but that’s how Deb titled it so that’s what I’m going with). I would pull the cookbook out and flip through it occasionally, but it never seemed like the right time to roast peppers and make risotto. The other night, however, it was cold and rainy for the first time in awhile, and I was getting an early start on dinner, so all of the sudden it seemed like the stars aligned. Of course it turns out I didn’t start quite early enough, as this recipe takes a fair amount of time. But an 8:30 dinner never killed anyone, and the recipe only calls for half a cup of beer, which means you can drink the rest of the bottle (and perhaps even a second) while you roast/peel/chop/stir. One way to save time would be to go to the grocery store beforehand, as that part took me almost an hour (I’m a grocery store wanderer). 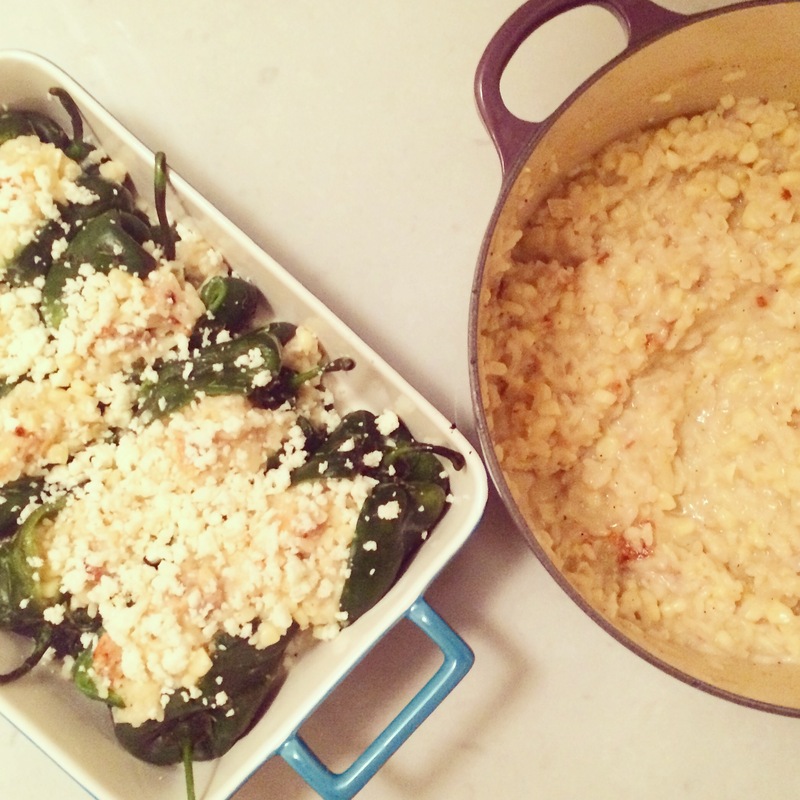 You could do the peppers and/or the risotto ahead of time, and then just assemble and bake at dinner time. Lastly, Trader Joe’s pre-chopped onions would be a good time saver. I was too lazy to make an extra stop, but as my eyes were burning while I chopped the onion I wished I had made the effort (actual conversation with my sister this morning: me: “it’s really worth the extra stop at Trader Joe’s just for the chopped onions.” Her, emphatically: “it is always worth stopping at Trader Joe’s for at least 10-15 items you can’t get anywhere else.” Words to live by!). 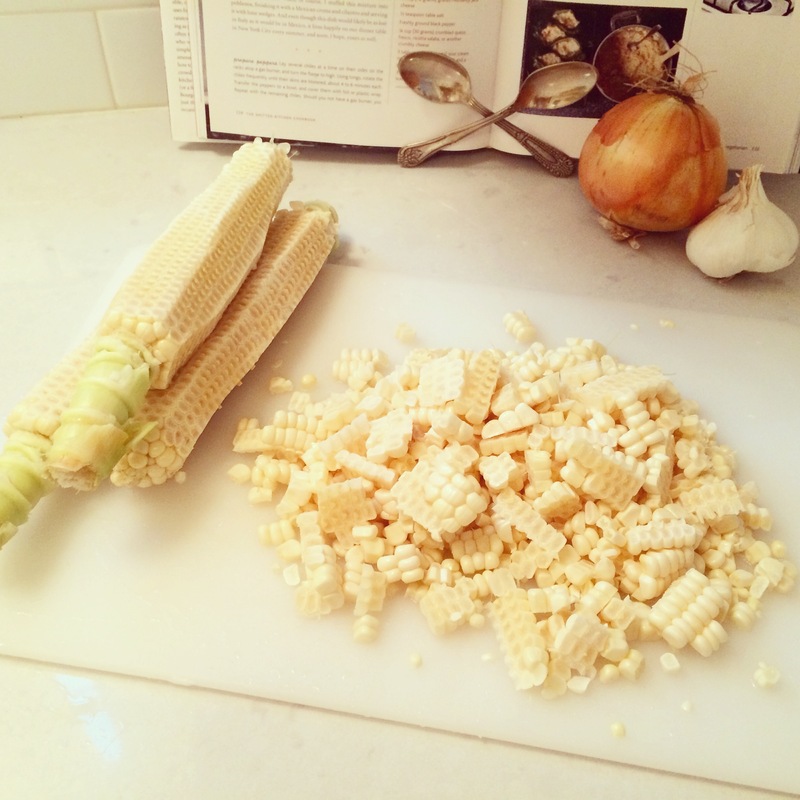 Frozen corn would save time as well, but the fresh is so good right now that it’s worth the extra couple minutes. 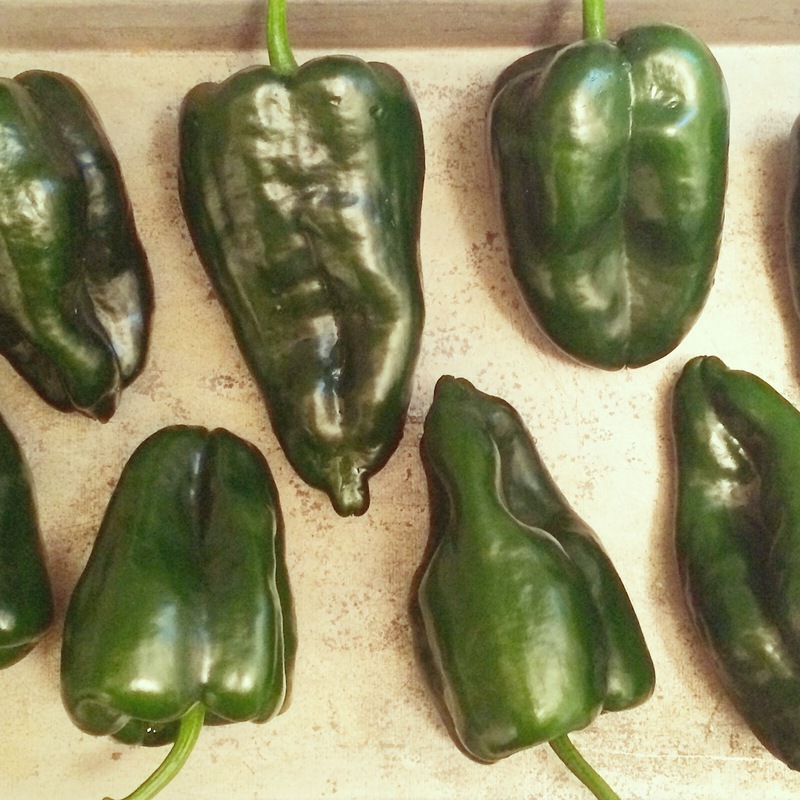 If you’ve ever roasted or charred peppers before, you know it’s super easy. If you haven’t, it might seem a bit daunting, but let me assure you it is not. If you have a gas stove top you can put the peppers directly on the grill; if not, putting them under the broiler works just as well. After making these, my tip would be: make sure the skins get completely blackened and “blistered.” I was worried I was burning mine so took them off the flame too soon – the blackened skin came off easily, but any parts that were still green didn’t want to come off at all. Which isn’t the end of the world, but to the extent you want your peppers skinned, make sure you char the peppers as much as possible. The good news is you can mess up the charring or the skinning or the de-seeding (see above) and they will still turn out delicious (although spicier with the seeds in). On the few occasions I’ve made risotto I always wonder why I don’t make it more often – it’s so easy and sooo good. And then I remember it’s a huge bowl of refined carbs with cheese, so unless I’m running a marathon the next day it’s perhaps not the healthiest choice for a meal. But let’s ignore that for now – here it’s very portion controlled, and involves corn and peppers – which are vegetables!! – so it could be a lot worse. And I accidentally bought reduced fat monterey jack cheese and it was still delicious, so there are ways to cut the calories if you’re worried about it (which apparently I am not). Aside from the 40 minute time frame and the fact that you have to be stirring it pretty frequently, it’s quite simple. In fact, it sounds like I may have to take up marathon running, because I’m now totally on a risotto kick. 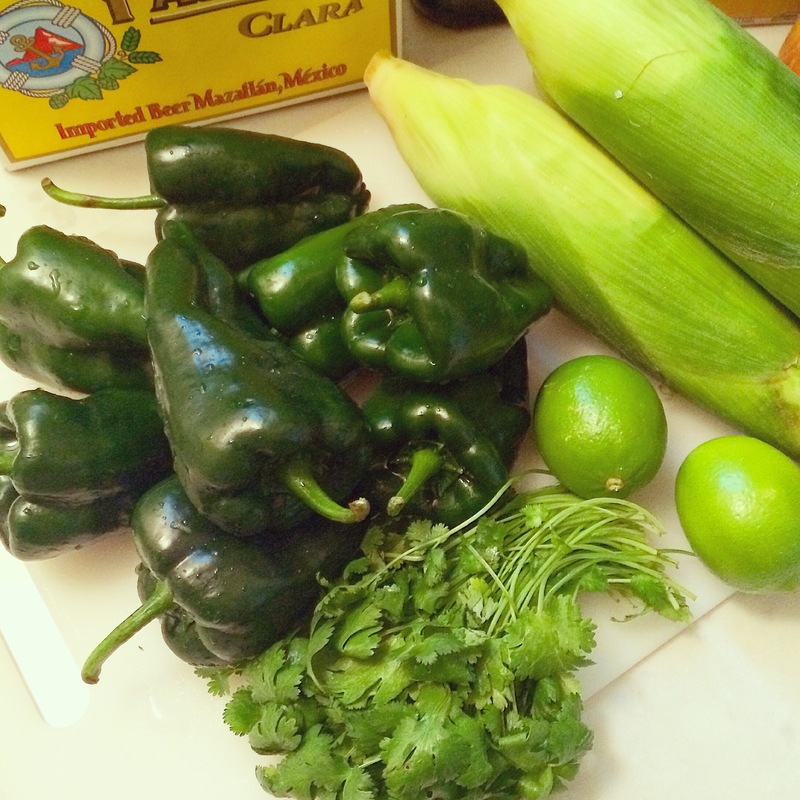 Place chiles directly onto gas burners and turn flame to high. Using tongs, rotate chiles frequently until their skins are blistered on all sides, about 4-6 minutes each. 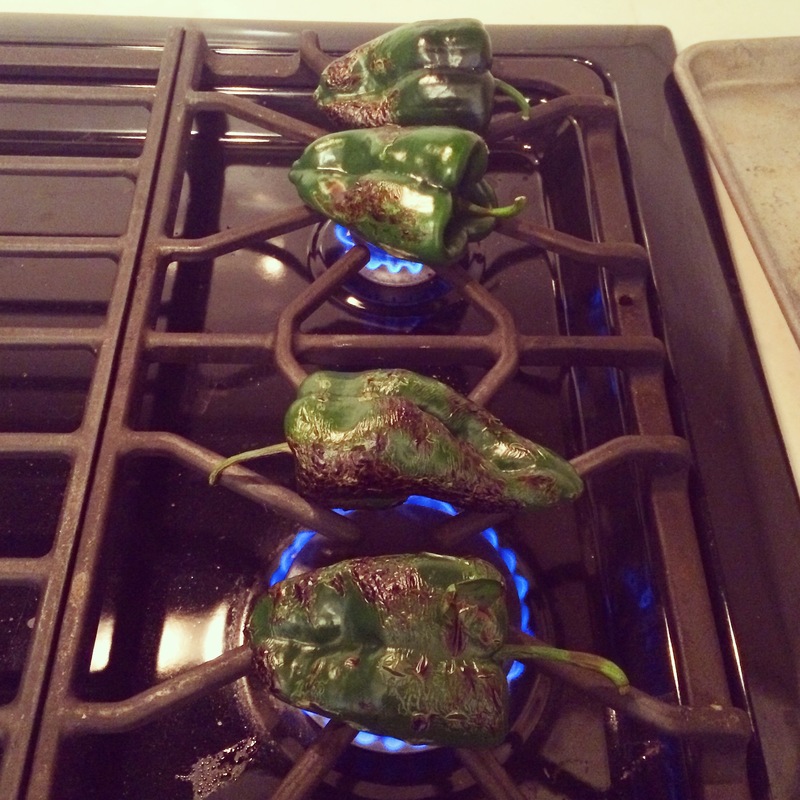 If you don’t have a gas stovetop, you can roast the chiles under the broiler (also turning frequently). 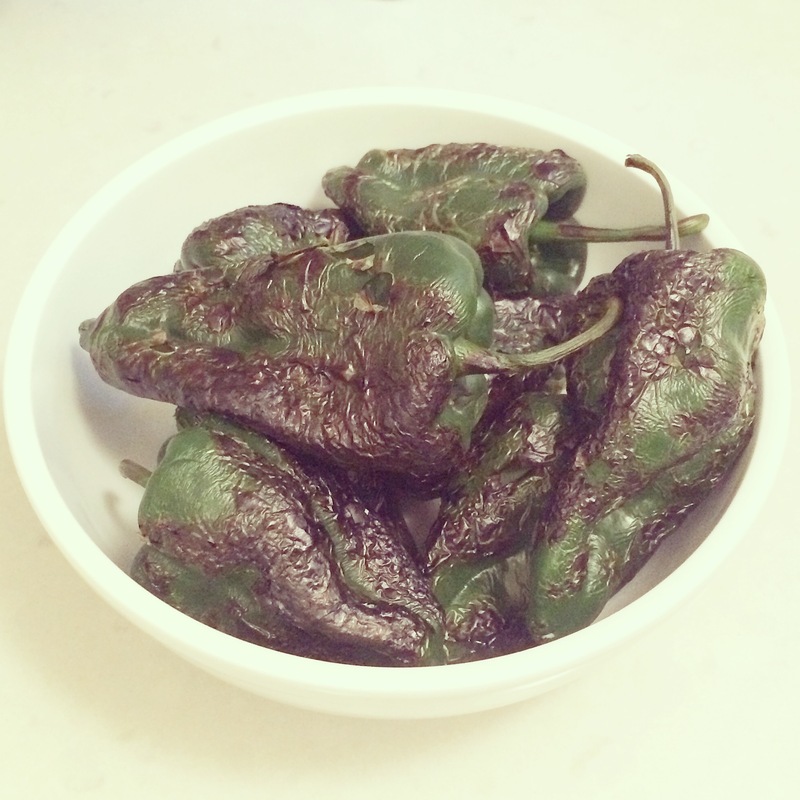 Put blackened chiles in a bowl and cover tightly with saran wrap. NOTE: Deb says you can skip this step entirely if the skins don’t bother you. In a medium saucepan, heat your stock to a low simmer. On a separate burner, heat a larger saucepan or dutch oven over medium heat. Once the pan is hot, add olive oil and heat through. Add onion to hot oil and sauté until soft and translucent, about 8 minutes. Add the garlic and cook one minute longer. Add the rice to the pot and stir for a minute or two, until it becomes lightly toasted. Pour in the beer, scraping up any stuck bits from the bottom of the pan. Let the beer simmer for a minute or so, until it’s almost disappeared. Ladle one cup of warm stock into rice mixture and simmer until absorbed, stirring frequently. Add remaining stock 1/2 cup at a time, allowing stock to absorb before adding more, and stirring often. Along with the final addition of stock, add the corn. Total cooking time for the rice is about 30 minutes, after which it should be creamy and tender. Once all the stock and corn are added and stock is absorbed, stir in the monterey jack cheese and salt and pepper to taste (I found I needed a fair amount of salt and pepper, perhaps due to my low sodium chicken stock). 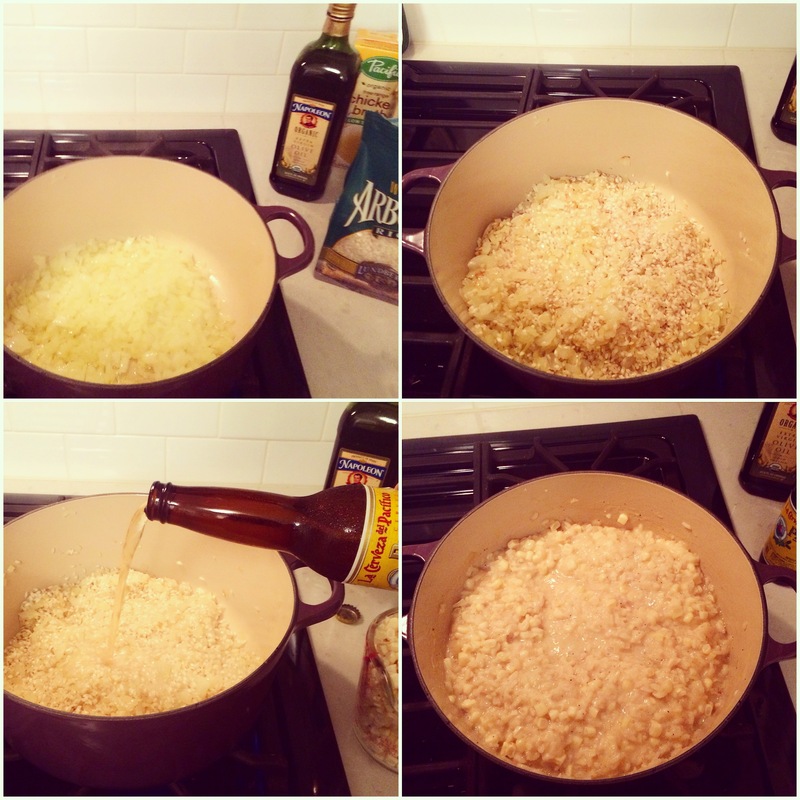 Remove risotto from heat. 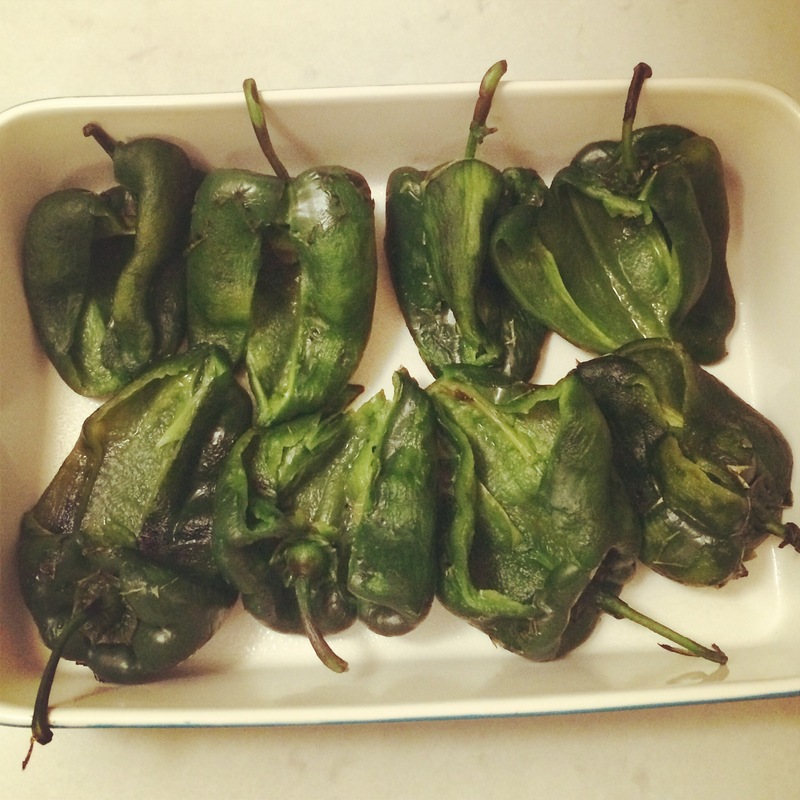 Preheat your oven to 400 degrees F. Remove chiles from bowl and gently rub off the skins, which should remove easily. Cut a slit lengthwise in each chile and remove the seeds and membranes as best you can. Leave the stems on – they’re cute. 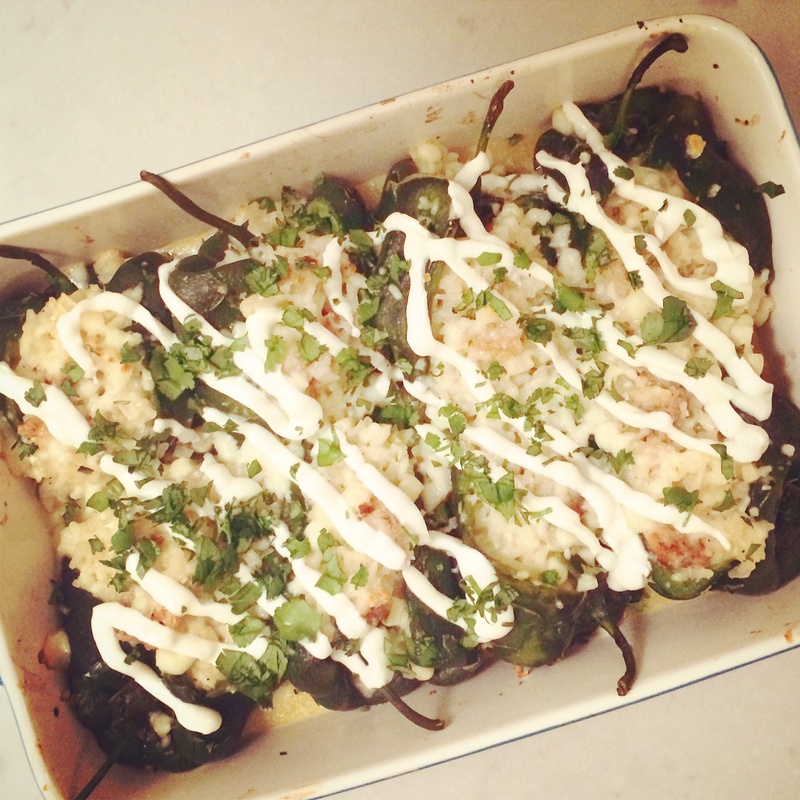 Fill each chile with risotto and arrange stuffed chiles in a baking dish. Sprinkle with the queso fresco. Bake for 10-15 minutes, until top begins to brown. 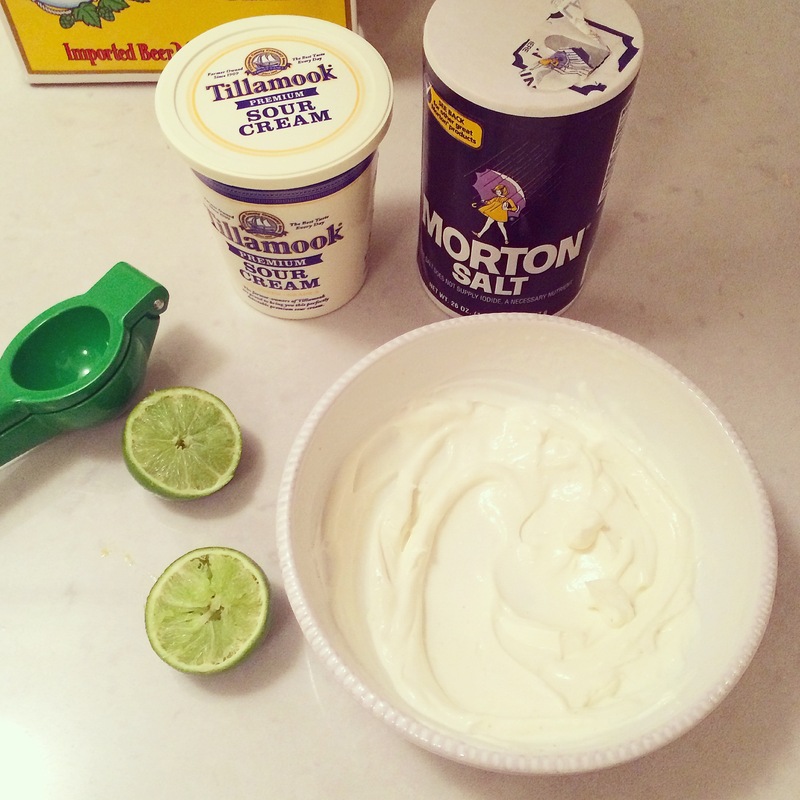 In a small dish, whisk together the sour cream and milk (or lime juice) with a pinch of salt. Drizzle the mixture over the hot chiles. Garnish with cilantro. If you make it, let me know how it goes! YUMMMMMMMM. Seriously, yum. I need to make this. But I worry I am too lazy. Thanks so much! If you try it let me know how it turns out! Your stuffed veggies look delicious!